Video Librarian Lists Into The Cold one of 2013’s Top Documentaries. 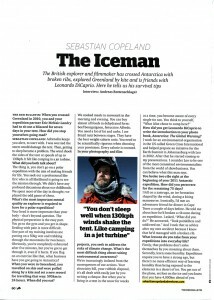 Sebastian Copeland’s North Pole documentary made the coveted Video Librarian’s Top 25 Documentaries List for 2013 alongside Searching For Sugarman and We Steal Secrets: The Story Of Wikileaks. 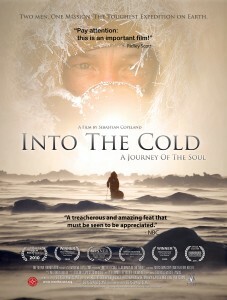 Into The Cold–A Journey Of The Soul (2011) retraces two men’s journey on foot to the North Pole to commemorate Admiral’s Peary’s centennial reach in 1909. 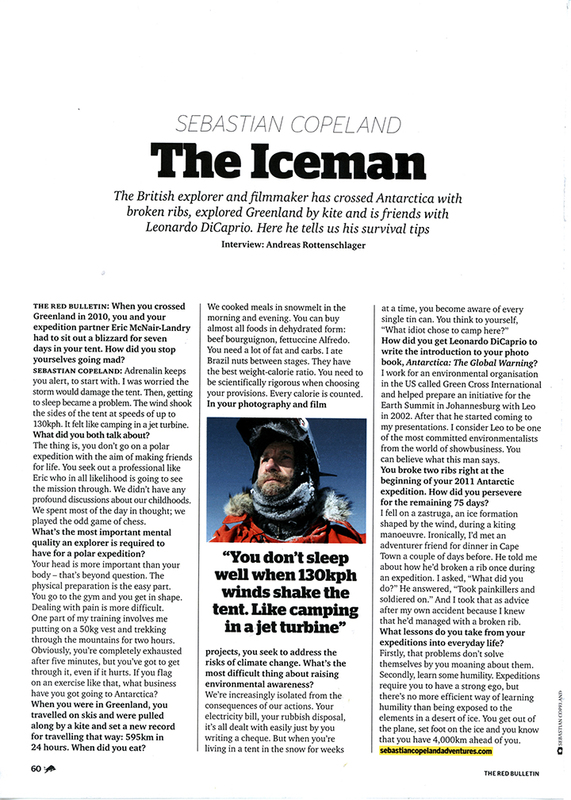 Directed by Sebastian Copeland, the film premiered at the Tribeca Film Festival and is now playing on Netfilx in the US, and is available with a special limited edition DVD on this website. Order it now and get a blanket! Michael Kurcfeld profiled Sebastian for the latest LA Review of Books (March 2014). The interview was conducted during Sebastian’s solo Antarctica: A Million Faces Of Ice at the Munich Bernheimer Gallery last year. The profile also features a filmed segment which can be seen here. As of November, Sebastian’s North Pole adventure film, Into The Cold–A Journey of the Soul, can be seen on demand on Netflix. The film chronicles Sebastian and partner Keith Heger’s centennial reach of the North Pole to commemorate Admiral Peary and team’s 1909 mission. The film premiered at the 2010 Tribeca Film Festival and went on to win multiple awards internationally. The Hollywood Reporter called it one of the five Must-See-Films of the festival. It has been released internationally since. What happened immediately following the pole, I’ll admit is a little hazy in memory. There was a touch of hysteria and excitement coming from a motley crew of characters worthy of an adventure-themed Fellini movie. Due, at least in part, to the Peary Centennial, there were multiple teams who accomplished various degrees of travel on the ice this year, most of whom scrambled, as we did, to make their exit with the last plane out of Barneo. Two of those, Huston and Fish’s (whom had we ran into two weeks back), and Lonnie’s shared the same glazed look we had on our faces. 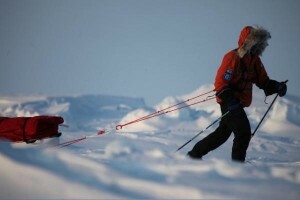 The other teams were on the ice anywhere from a few days to two weeks; some with and without dogs. Many gave us various thumbs up and good ‘ol taps on the back. I am sure we would have exchanged notes and shared battles stories, and perhaps we did. But by then, I was so engrossed in the box of cookies that the combined sugar rush and culture shock made for a messy, disorienting blur. That blur was in fact not just figurative: on that final day of travel, my eyes were watery, and as the wind froze the tears on and around my eyes, my vision was impaired for much of that day. It also worsened a cold injury on one eye, and developed one on the other, making me look as if I’d gone a round in the ring—or a few seconds—with Tyson! In all we were perhaps 15 people on the pole that day. But because of the drift and the staggered arrivals, camps were scattered by as much as a mile apart. This gave us all our private, albeit brief, moment on the actual pole. There is only one, relatively narrow spot that has legitimate claims to be the top of the world; one of two points around which the rest of the world rotates. For whatever reason, and there is no denying it: it feels good to stand on it! When the helicopter finally got all the teams together, I know that some were keen on taking group shots and downing a symbolic swig of alcohol. But my focus was on two things: making sure not to forget any sponsor flag shots, and keeping track of those aforementioned cookies! Seriously, it was so chaotic that it would have been easy to forget what I had thought so long and hard I would do when I got there. Keith helped me focus and took the snaps. 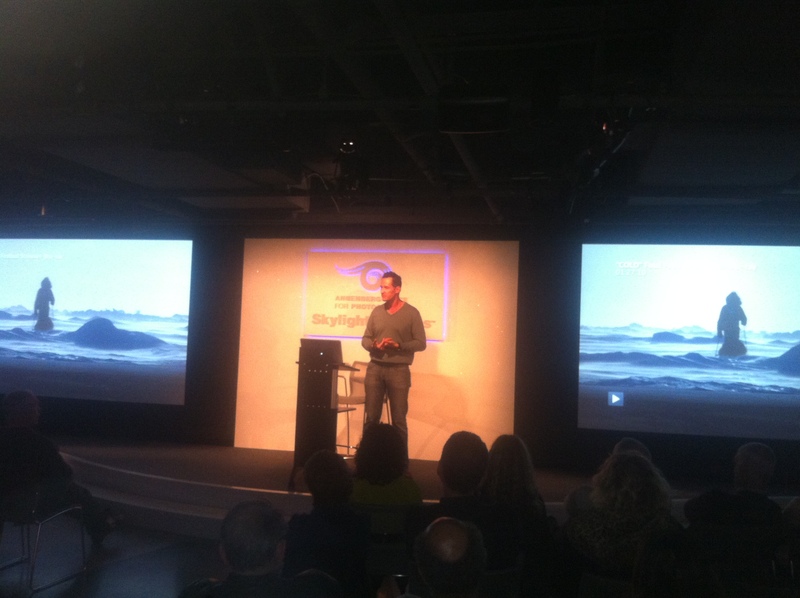 I had a moment to acknowledge my friends and associates at HP, Napapijri, Global Green USA, MySpace, Climate Partner, Lawrence Benenson and Lexar for their critical and varied support through the course of this mission. I also got to fly the Union Jack and the French at the pole, representing both my cultures. A friend had asked me to leave a small satchel containing a photo of their recently perished sibling. That, too, was done. 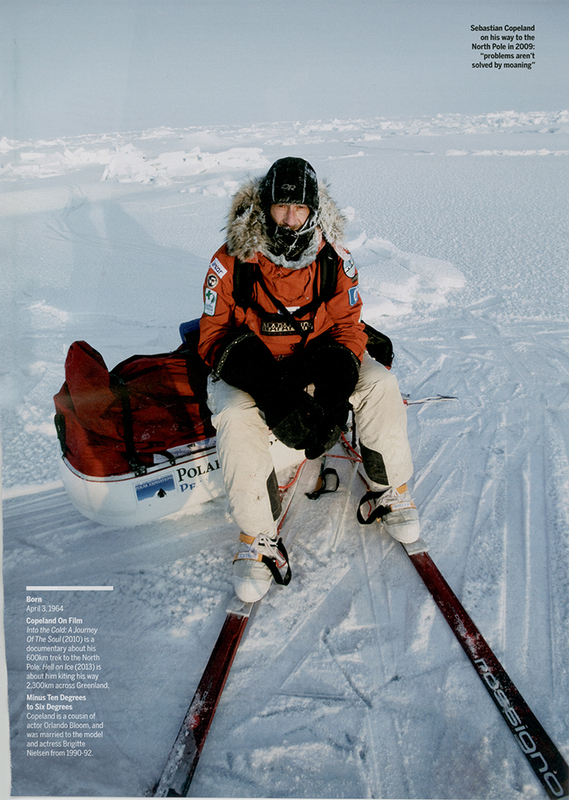 As well, I got to take some personal moments; and make a couple of rapid and frigid phone calls from the last battery leg of our satellite phone. The people who mean the most to me got a call each: my parents. One went to my friend and business partner who put so much heart and hard work to develop and maintain this site: Mikhail Lapushner. Thank you, brother! Soon we were rushed into the MI8, piled up on top of the dog sleds, the dogs, the long trip sledges, the short trip sledges and one another. The circus that had descended on the pole on April 26th, 2009 was leaving town. The timing was probably right because even though the game was up, and in spite of all the excitement, the temperature was still very cold! I stared out of the port hole of the helicopter as we lifted off to Barneo, feeling real fondness and nostalgia for this tough and unforgiving environment. The end came abruptly; systematic and unapologetic, as can be expected from such a momentous and prolonged experience. For a while I stared in silence at the field in front of me, taking in the open, unrestricted ice kingdom; committing to memory its vastness and the contours of the mounds and ridges framing it; noting the way the sun defined the terrain; feeling the wind biting my left side; and for once relishing the chill that sneaked past the steam out of my base layer. I heard my heart pounding, fresh from the effort, tugging at me with undecided trepidation, not sure whether to weep in relief or beg for more. Any moment now, this solemn and suspended reality would be broken by the distant flapping of the helicopter’s rotors. And the dream would end. Last night in the tent was to be our last. We gathered all the food we had left, including our emergency bag, combined it, and fed ourselves a copious dinner. We slept short and cooked our final breakfast of warm granola with goat milk powder, dried fruits and nuts. We even found an emergency protein mix! Cramped in the tent as we have been everyday for the last thirty five getting dressed, I noted one more time how a program based on tent activities would make for a great core workout! (Note to Yumi and Ron–my trainers!) This was going to be a long day, and for the first time in weeks, thanks to the emergency food bags, we both had extra bars for the road. Six each, in total. A real feast! The day was sunny with a ten knot breeze out of the north west; it would hit us in the face from the left. But the terrain was well defined, and the flat pan we had ended on yesterday stretched in front of us for another long haul. That pan was unreal: it must have gone for over fifteen miles! We’ve not seen anything like that for the entire trip. In fact, it has been shocking how little multi-year pans we saw; mostly one to two year old sections, which tend to be a lot more jagged and fractured. And a lot of one year old, messy rubble zones—as we know! We broke up camp for the lat time, packed our sledges and shot out of the gate. The combination of extra food, and our last chance to reduce the miles separating us from the pole gave our legs new springs, and put jetpacks on our backs. Except for two slightly messy and powdery bits, we had open terrain all day and traveled at an average of 1.4 miles per hour–twenty percent over our daily average! (As well today, ironically, the drift finally slowed down!) Victor had asked me to call him with our position at eight thirty AM, Longyearbyen time (this close to the pole, you can basically chose the time zone you wish to align yourself with—it makes no difference.) We would call from the trail. He would then take off from Barneo shortly after nine, and planned to pick us up between 10 and 10:30 AM (Barneo, the temporary floating station, is on the east side of the pole, drifting around N88°17.066′ and E 3°34.270′). This gave us a solid twelve hours, uninterrupted. With nothing but open space in front of me, I motored and skied hard. My legs got sucked into the rhythm, and never complained. Nor did Keith, though I knew his hip bothered him. But the day was set to put a mark on our vanishing legacy. Each hour that passed was punctuated by the pleasing speed that would define our last travel day, and the looming and steady creep of a countdown that brought a mix of relief and sadness. The last few days have been the toughest, but today, in spite of the wind’s chill, we are eating miles and feel unstoppable. 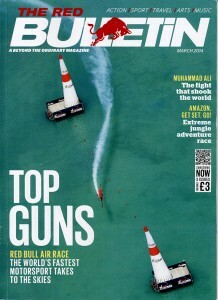 Besides, we have fuel, and those bars make all the difference. Still, I find my mind wandering seamlessly from the chanting meditation to food fantasies! In the distance, the wind carried the unmistakable flapping of the MI8’s rotors. Invisible at first, the heavy craft appeared south of us, first a dot growing to dominate its surroundings by its alien form, and loud engine. In no time we were dropped on the ice. 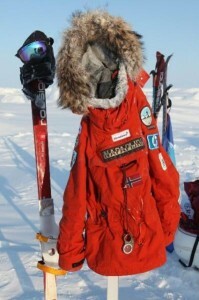 A quarter of a mile from us laid the North Pole. 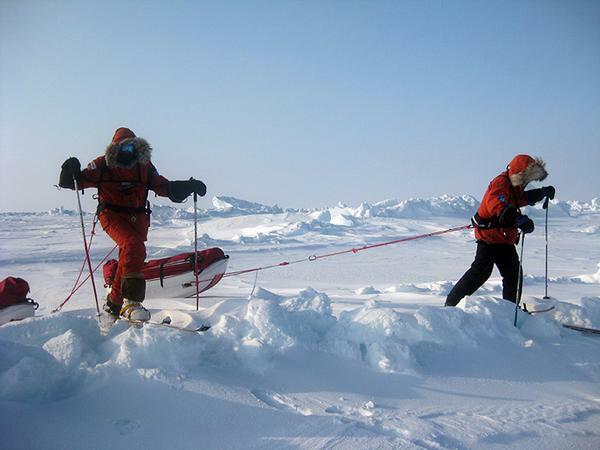 Symbolically, we pulled our sledges off the craft, got in to our harnesses and skis, and marched to it. A point that does not give itself up easily–the drift makes for a fierce defender of the pole–one moment right, the next left, you think you are about to have it and then, no: you’re headed the wrong way! I walked in circles with my GPS for ten minutes until it read N89.59.996; then 997; then 998… 999… Finally, my unit read: North Pole N90.00.000! I shot it with my camera, locked it in the unit to record it. And in seconds, just like that, it was gone. That point from which any step heads south, the top of the world, where all longitudinal lines blend and all time zones meet, was mine for one brief, ethereal instant. And then no more. Over the course of 14 to 15 hours of day in/day out pulling, there are many instances when the effort feels overwhelming; and endless. Your legs lose all power; your back and arms burns. You reach a physical barrier that screams for a break–generally a power bar or drink break. These tend to be short, as you must be cold at stoppage in order not to sweat during effort (for then you’d get dangerously cold during breaks as the sweat would freeze). Those short breaks, and any type of food, sometimes even just a candy, give enough mental seperation from the effort to bring fresh reserves until the next cycle. It occurred to me that life is like that, too. Sometimes if you are challenged and see no end to it, it is important to acknowledge that this time shall come to pass, that everything in life is transient, and therefore not to let it affect you. This will be my last dispatch from the ice for this trip–tomorrow our last pulling day here. After five weeks of this epic adventure, I know that re-entry will be a challenge. But all things do come to an end–and I could really use a sandwich! The last few days have been the toughest. 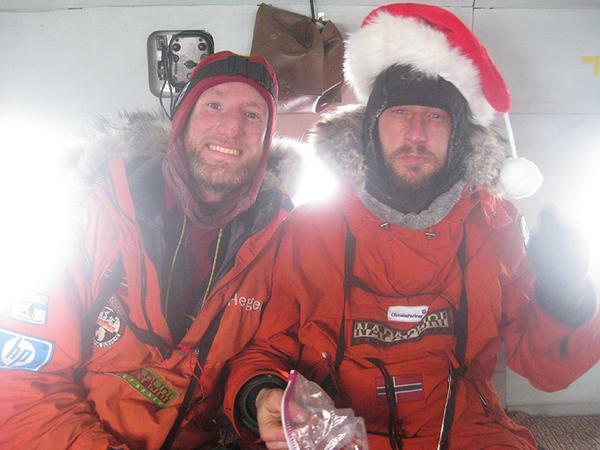 We pulled long days, with reduced food rations, and the conditions were especially tough. But today, perhaps a salutation to honor our effort, the sun was mostly out, the winds died down, and we traveled open pans with only a few pressure ridges to cross. The temperature fluxed between negative 15F and 20F degrees. This was perhaps our easiest travel day. We lost 2.5 nauticals overnight to the south drift, but managed 14.5 nauticals in 13.5 hours of travel, which means we likely did 2.5 on top of that. As I sit here, typing in my iPAQ (great PDA by the way–amazing communications tool) I cannot help but think of Peary, Henson and the four Inuit on their team, and how after reaching the pole on Aril 6th 1909, they then had to face the un-assisted return to land, for another month of journeying. 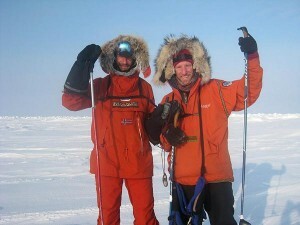 They were no satellite phones, no blogs, no power bars, no technology developed Napapijri fabrics, no nylon tents. Just six brave men facing the unknown with no safety net, and no back up. I would raise my protein drink to them in salutation–but i’m all out! Good night. I will report back from Longyearbyen, from which we are making our exit. Until then! The wind finally let up a bit today, though the conditions were generally mediocre with low visiibility for the most part, and the sun struggling at the losing end with cloud cover. Some nasty times were spent in two rubble fields, something that we hadn’t done in a few weeks. We hadn’t missed much, and the experience remains as unpleasant as ever–hard to find the selling points of pulling heavy sledges up and down large blocks of ice burried in thick powder, generally forcing us off our skis. While a definite improvement on yesterday, that wind gets right through you during the short breaks. We spend those chewing the most out of our rationed energy bars to make the experience last longer! Any mouthful of flavor is a treasured experience to both taste buds and our growling stomachs. Keith and I have come to sorely miss the Herbalife protein bars which we have ran out of ten days ago. If you haven’t had one of those, you should try them out: they’re really tasty! The south drift robbed us of three miles last night and today we pushed hard for 15 hours and made 15 nautical miles. Given the loss ratio to the drift, we probably traveled 18 NM or more, so this was a big day, much of it spent–luckily–on large flat pans. Our stopping position was N88°55.802 and W37°09.620. We’ll be out of 89° tomorrow. Finally.